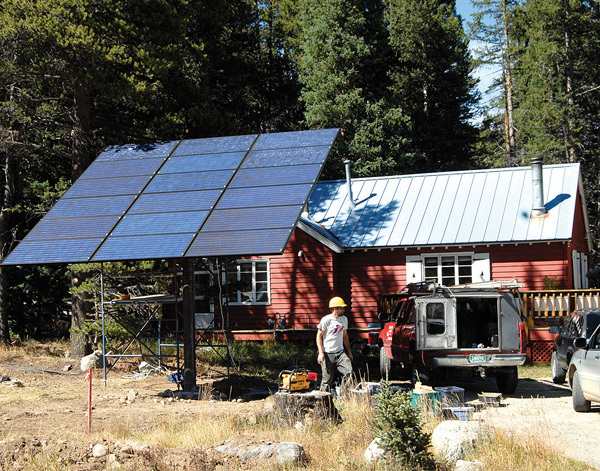 BLUE RIVER – A local property manager recently won her lawsuit against the town government after it denied a large, photovoltaic solar-panel application next to a home. Installation of the 20-feet-high by 16-feet-wide ground-mounting nears completion next to Colorado Highway 9 today. “I’m thrilled to be moving forward,” said Michele Tonti – who filed the suit with CDOT Irrevocable Trust – adding that it was “about time” after a year and $10,000 spent on the legal process. The Blue River Board of Trustees had overturned the town planning commission’s approval of the application, citing contradiction with the town’s architectural guidelines and saying it was out of proportion with the home and not “aesthetically pleasing,” according to a previous court filing by the town. District Court Judge Karen Romeo in her findings stated that the town “abused its discretion by misapplying its own regulations” but that the town may consider different guidelines, according to her opinion and order filed last month. Mayor Lindsay Backas said the town has since changed its guidelines for solar panel installations. The 3.51 kilowatt solar array with 18 panels is estimated to generate 5,294 hours per year – enough to provide most or all the power needs of the 1,096 square foot home, according to information from Innovative Energy, the Breckenridge company installing the panels. “The panels are designed to absorb light, not reflect it,” he said, adding that the panels’ position isn’t likely to cause a glare anyway. More expensive and efficient than roof-mounted solar arrays, the pole-mounted system costs roughly $28,000 before rebates. But between rebates and a tax credit, the cost falls to about $10,500, McPherson said.